This Thursday, I am exhausted. I know you don’t want to hear that, but I am. Who knew staying home was so much work. Am I doing it wrong? Anyway, I am oh, so grateful, this week for so many folks who are helping me with my problem of over-commitment. I think it’s an illness I’m hoping to put in remission soon. First up, I’m beyond blessed by this sweet friend. Somehow during her kids’ naptime yesterday she managed to help me do my MOPS job, calm my nerves, and encourage my heart. who doesn’t love baby showers? And though I was a little apprehensive at first that I shouldn’t have tried to plan something on a week when I’ve got a dozen other commitments, the blessings that have come my way during this week have been amazing. And the shower’s not even for me! When our host site was already booked, another wonderful friend offered to host at her beautiful new home (that’s right across the street! ), ladies are planning dishes galore and everyone can’t wait to decorate in blue for this family’s first little boy (he’ll be welcomed by three big sisters). But for me, the best part has been finding the most wonderful deal on the perfect gift. Can’t wait! It’s not this…though that would have been fun! Who wants to do this for the next baby shower? Finally, we’ll be traveling over to E-town for the first time all summer to celebrate birthdays and the anniversary of my grandparents at our annual family event: Lazy Hazy Crazy Daze of Summer Meltdown. And that’s an event sure to be blog-worthy. Good food, fabulous fam, big waterslide. And a meltdown or two, I’m sure. Have a fabulous weekend (you know you’re already planning it)! Linking up with the crafty Julia at Black Tag Diaries. pinterest is so inspiring. i visit there and feel like i could create absolutely anything! oooo… those baby shower ideas look delightful! can't wait to hear how it went. i feel you on the over-committment issues… let me know if you figure out a cure. you're so sweet. i'm thankful to have more time with you this year! 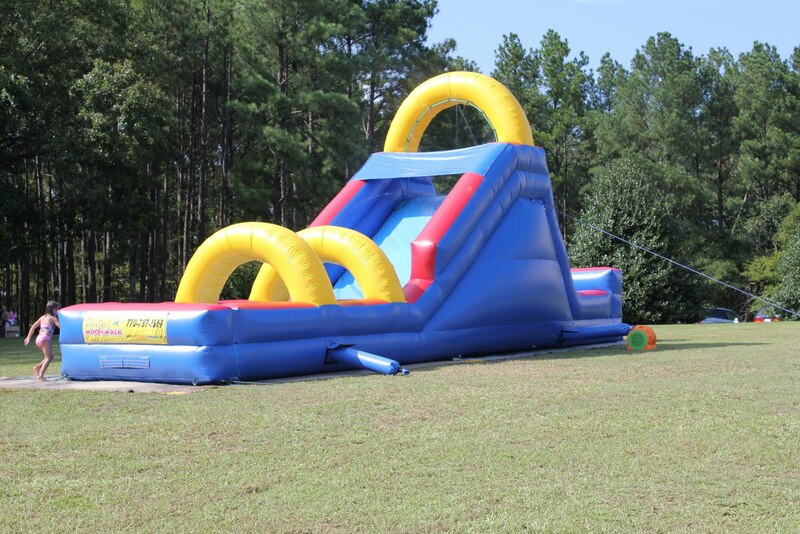 can't wait to see some photos and hear how the monster water slide at your annual family fun fest went!